How we met: We went to the same school and first remember meeting each other at an All Schools Touch Football carnival. Ryan had been at McDonalds and came back with a double Oreo McFlurry but he didn’t have time to eat it before his game. He asked me to hold it and of course I ate it, it would have melted and I didn’t really think he expected it back. He was unimpressed and I think he still holds it against me! Proposal: We flew down to Sydney on a Friday evening to spend the weekend celebrating our five year anniversary. When we arrived at our hotel, the Shangri La, not long before midnight, Ryan insisted we go to the rooftop bar for a drink. We were shown to a reserved corner table overlooking the Harbour Bridge and Opera House. He asked me all the reasons I love him before telling me all the reasons he loves me. He got down on one knee as asked me to be his wife. I said yes and proceeded to cry happy tears for the next hour while we drank champagne and ate chocolates. We spent the weekend adventuring around Sydney in newly engaged bliss. 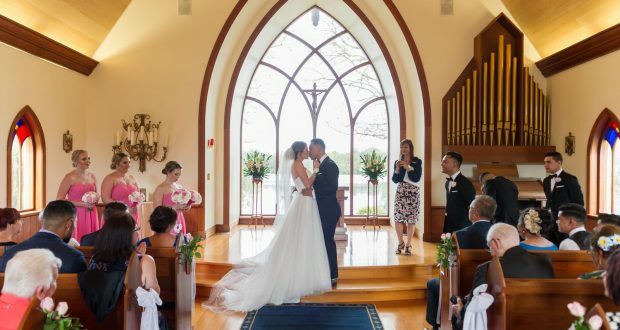 Ceremony: Avica Chapel in Merrimac. It’s most breathtaking feature is the large window behind the altar overlooking a lake and greenery. It was writing our own vows that made the ceremony the most special. Ryan made me laugh by promising that what’s his is mine, except his Xbox, and made me cry by simply promising to love me. 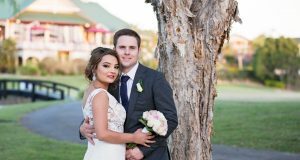 Music: We chose a very special song for our first dance – ‘’Sweetest Thing’’ by Shane Piasecki – which has been our song since we started dating. Reception: Fountain Room of Links Hope Island. They were incredibly accommodating, helping us design a room layout to suit our needs, answering my calls and texts after hours and ensuring the reception ran without a hitch. We chose a two course dinner with our delicious cake for dessert. 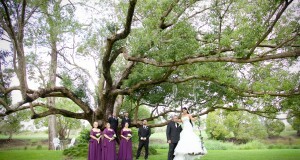 Photography: When we received our photos from Leigh Warner Photography we were completely blown away. Leigh does an incredible job at capturing the emotion of the day. Looking at the photos takes us back to each moment – some we didn’t even know were being photographed – and allows us to relive the tears and laughs of the day. It’s a really special talent that Leigh has. He creates living photos that make the most special moments last forever. Honeymoon: An epic three week trip to the USA and Mexico. We visited New York where we went row boating in Central Park, watched an Ice Hockey game at Madison Square Garden, and walked back and forth across the Brooklyn Bridge. We went to Las Vegas and went on a helicopter tour to the Grand Canyon, stopping in the base of the Canyon for breakfast. In Los Angeles we took photos with characters at Disneyland and saw celebrities on the red carpet for a movie premier. We finished our trip with a relaxing stay at the adults only Excellence Playa Mujeres Resort in Cancun. Advice: Make sure you eat your dinner! We were too caught up and didn’t eat. By the time we got back to our hotel we were famished. We took out my million bobby pins and walked to Dominos for pizza. Things that were exceptional or went wrong: The only thing that really went wrong was actually hilarious. Ryan is Samoan and during the reception I did a traditional dance where men will come and lay down in front of you as a sign of respect. One of Ryan’s uncles laid on the front of my dress and I couldn’t move! The photos are hysterical. There was so many exciting, unexpected, fun things that happened, but one of the best moments of the day happened not long after the ceremony. Everyone was leaving the ceremony venue and we went back in to the chapel to cool off in the air conditioning. Ryan and I sat together and breathed and absorbed that we were actually married. It was one of those can’t plan for it moments and our photographer Leigh caught it on camera.